This rugged Bobcat mouthpiece puller is a must for every band director! Care must be taken when removing stuck mouthpieces from the receiver. The mouthpiece is cradled in the tool with collars that gently add just enough pressure against the receiver to remove the mouthpiece. Works on all brass instruments. 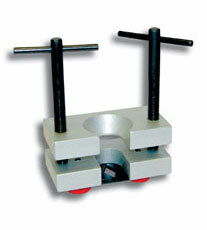 Prevent broken braces and twisted lead pipes use the Bobcat Mouthpiece Puller.